I’m pleased to announce that I’m a new member of S.E.W., The Society for Embroidered Work. S.E.W. is an international society of artists who work in embroidery as their medium. Membership is by application once or twice a year and chosen based on the quality of the artwork. I’m very honoured to be a part of this society, which is helping to bring embroidery into the art world as a serious medium. I’m pleased to announce that the In Corpore Sano anthology has begun publishing excerpts on Medium, including some of the writing I’ve done for the anthology as well as some of my symptomatology and anatomy embroidery pieces. My personal essay excerpt, Meaning Making/Making Meaning :: In Corpore Sano presents Lia Pas outlines the way my creative practice has changed since becoming ill with ME/CFS in 2015 and has a number of my embroidery pieces as illustrations. Amanda Glassman has written an outline of the online series titled Hello to IN CORPORE SANO :: Creative Practice & the Challenged* Body :: a web & print:document series . 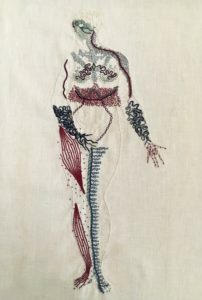 Also, Written Over :: In Corpore Sano Presents Jill Khoury, a set of poems and prompts, is illustrated by another of my anatomy embroidery pieces. There will be weekly excerpts published on Medium for the next few months, so please visit the In Corpore Sano Medium page for more writing and images on the challenged body as they are published. US addresses can pre-order the print anthology for a discounted price here, but Canadian addresses will need to wait until the anthology is published in March or April to order a copy. I have reached a point in my recovery from ME/CFS that means I am able to write again! ME/CFS is a neuro-immune disease and some of the symptoms include brain fog and cognitive fatigue. When I first got ill in 2015 I was unable to read or write for any length of time because it would utterly exhaust me. I’m very happy to say that I can now read and write with relative ease again.